WOW! Fantastic Views!!! Newer home, only 17 years old, has an Aspen Colorado feel! Privacy but just outside of town! This unique home is prefect for someone that loves the outdoors and nature! The main floor has a kitchen/dining area with custom kitchen cabinets, main floor laundry room, bedroom with a full bath, currently used as a TV room and a Living room. Beautiful wood walls, lots of windows, wood burning stove. Upstairs is a large bedroom with a walk-in closet and full bath. Hobby room with lots of built-in cabinets and another room which could be a bedroom. Lower level has a nice family room, office area and a great Hobby room. 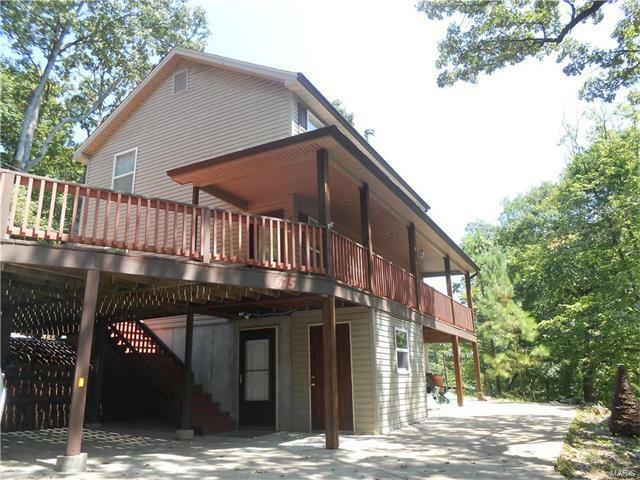 Large deck with views of the Meramec River and woods, Large Patio on the lower level, gives you tons of entertaining space. Big Bend Road to South on Kiefer Creek Road, stay straight at the stop sign, down to Wildlife Rescue, go Right on Castlewood to Left on Meramec which is a gravel road to house on the Right.